Today’s sensational climax of the 2013 Allam British Open Squash Championships, the fourth PSA World Seriesevent of the year staged on an all-glass court erected on the pitch of soon-to-be English Premier League football club Hull City, saw Ramy Ashour make history by becoming the first Egyptian in 47 years to win the sport’s prestigious title. Despite having produced world champions, world number ones and currently five players in the PSA men’s world top ten, Egypt has not boasted a British Open champion since 1966 – when the legendary AA AbouTaleb won the trophy for the third year in a row in London. 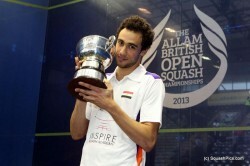 Undefeated since losing the 2012 final in London exactly a year ago, Ashour was firm favourite to have his name inscribed on the trophy this year. But the top seed dropped his first game of the tournament as French rival Gregory Gaultier took an early lead in the final of the first staging of the event in Yorkshire since 1974. Gaultier, the first French winner of the title in 2007, tried to continue where he had left off in the second – but was unable to take the ball as early as previously with Ashour become more patient on the attack. As the Egyptian forced the Frenchman into making more errors, Ashour grew in confidence and finished the second on his first game ball to draw level. 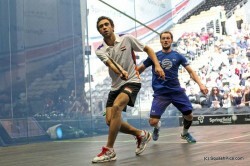 Gaultier started the third with more aggression with 25-year-old Ashour making a few uncharacteristic errors. At 7-5 to Gaultier, it looked as if the match was swinging back in his favour – but a few patient rallies and errors from the world number three got Ashour back on track at 10-7 and again the Egyptian closed out the game at the first opportunity. 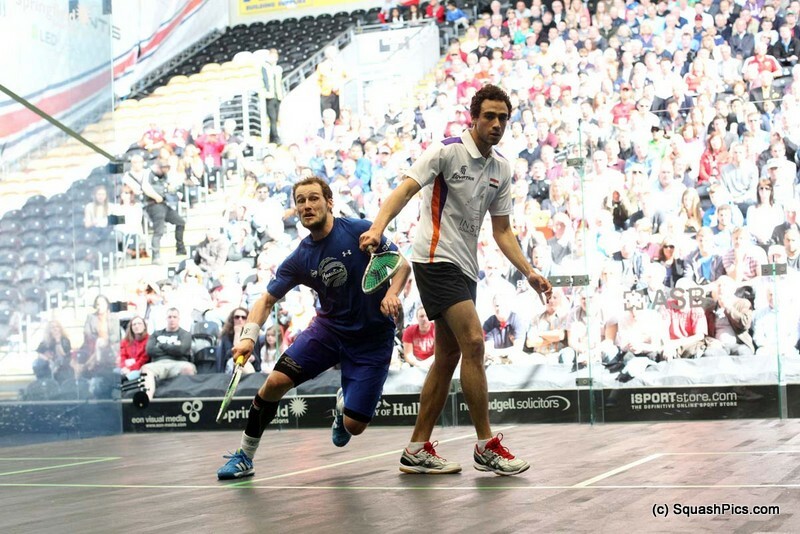 Ashour built up a 6-3 lead in the fourth as his opponent began to show signs of fatigue. But a series of unforced errors from the Cairo king saw Gaultier win four points in a row to lead the game for the first time. Ashour regrouped to reclaim the lead and after both players put the ball out of the court in successive rallies, Ashour clinched his first match-ball with a deft forehand shot into the nick to win 7-11, 11-4, 11-7, 11-8 in 64 minutes. After shaking his opponent’s hand and seeing Gaultier out of the court, Ashour leapt into the air in celebration before falling to the ground to kiss the floor – where he stayed for several minutes, clearly tearful with emotion. When asked to express his feelings, several minutes later, the new champion said: “There’s a famous quote: the game is just a game – it’s what you play for that matters. “I’ve been preparing for eight weeks for this tournament – but I’ve had lots of hard times over the last two weeks, so I’m really proud of myself for what I’ve achieved. 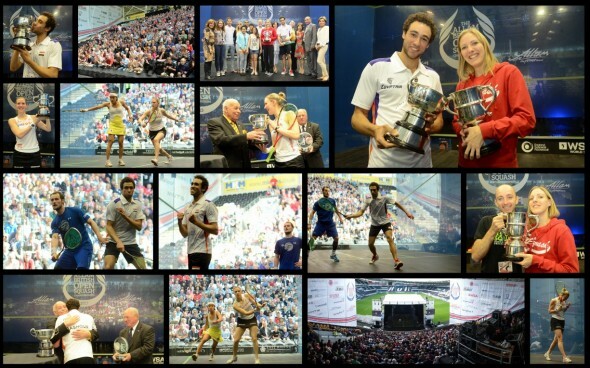 “Winning this prestigious title is one of the happiest moments of my life, if not the happiest,” continued the exuberant Ashour, now winner of his 41st PSA Tour match in a row, and his eighth successive title. “I’ve experienced waking up in the morning every day with a heavy heart and a heavy spirit. There have been a lot of distractions. But I’ve learnt a lot from the last couple of weeks. “Winning this title is really big for me. 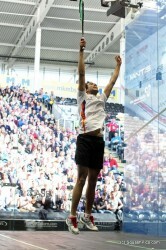 It’s something I will always remember,” the new British Open Champion concluded. A disconsolate Gaultier said: “I’m very disappointed. I did what I could. I wanted to win so much. 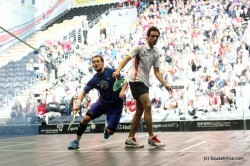 “But Ramy played better today and he thoroughly deserved it. “Hopefully next time I will come back stronger. I really want to win this title again,” concluded the 30-year-old from Aix-en-Provence. 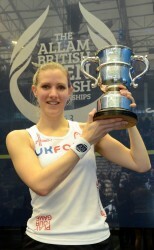 Laura Massaro has become the first Englishwoman to win the Allam British Open title in 22 years after a superb performance to defeat top seed Nicol David. 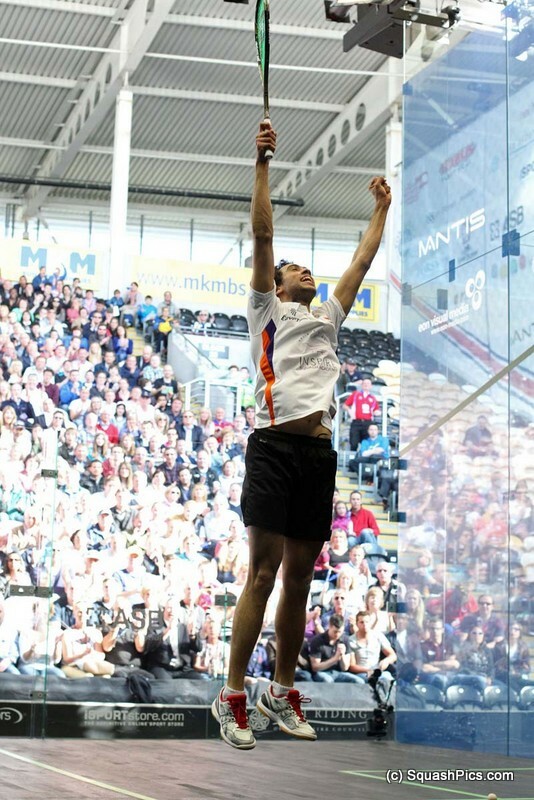 The 29-year-old from Preston saw the perfect start to British Open campaign, beating unseeded Joey Chan in the opening round, followed by a tricky four-game tie against Dipika Pallikal of India. Massaro needed to another good performance to see off the challenge of Egyptian Omneya Abdel Kawy in the quarter-finals, before recovering from a game down to beat close rival Raneem El Weleily in yesterday’s semi. All the signs were pointing to another title win for Nicol David, as the world champion from Malaysia looked strong in her early round matches against Joshana Chinappa and Sarah Kippax. In the quarters she dismissed Joelle King in straight games, andAlison Waters faired no better in the semi-final round as the seven-time world champion moved into the final yet to drop a game. Massaro, who defeated the world No.1 on her home-turf in the KL Open in March, got off to the best possible start in the final of this$90,000 World Series event. She stormed to a five-point lead before David could register a response, and had her opponent retrieving into all four corners of the court. Volleying well and picking her moment to attack short, the Englishwoman closed out the first game, but David game back in the second with all guns blazing. Her length extended, she caused problems for Massaro for the first time in the match, who struggled to gain time on the tee, pinned to the back of the court. A 7-1 lead was soon converted by the Malaysian to draw level, which set up a nail-biting third game. Both players battled for the middle of court, hunting the volley to deny the other time. The scores remained close throughout the game until David snuck ahead in the last few points. Massaro salvaged three game balls however, and served to win the third game before winning the crucial point on a video review stroke. With the home favourite back in front, David refocused but was unable to launch a similar counter attack as she had in the second game. Massaro, tactically astute all match, stayed with the higher seed during the early points, before pulling ahead to 7-3 with the crowd roaring their support. David’s error count increased uncharacteristically as she searched for the winning points, and wasted a vital point by serving out to gift Massaro championship ball. The four-time British Open winner salvaged two points, but this was not to be her year as the packed audience celebrated witnessing the first home winner of the British Open since Lisa Opie in 1991. An excellent tactical effort from Massaro sees the Englishwoman clinch the third World Series title and the twelfth of her career.